The main difference between stain and dye in histology is that stain is a mixture of several dyes whereas dye is a substance that highlights intracellular or extracellular elements of a tissue. In addition, a stain gives contrast to the tissue as it highlights different components with different colors. On the other hand, a dye may highlight only a specific component within a tissue. Stain and dye are two types of chemical reagents used in the staining process of the tissues. They give an inherent contrast under the microscope. A stain is a mixture of dyes that enhance the contrast of the microscopic image. In general, most cells that make up tissues are colorless and transparent. 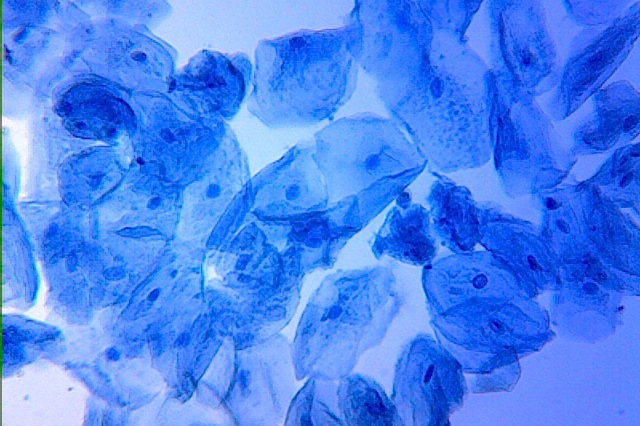 Therefore, tissues are stained in such a way to make the cells visible. The chemical reagents used in the technique are the stains. Each dye within the stain selectively highlights a particular chemical entity within a tissue. Therefore, several components of the tissue can be in different colors. Hence, stains give a contrast to the microscopic slide. A dye is a single chemical component contained in a stain. A single dye can highlight a specific type of chemical entity within the tissue. Therefore, in order to highlight several components in the same slide, a mixture of dyes has to be used. The two main types of dyes are acidic dyes and basic dyes. Basic dyes react with anionic/acidic components of the tissue such as nucleic acids. Acidic dyes react with the cationic/basic components of the tissue such as proteins. Stain and dye are two types of chemical reagents used to highlight specific components of a tissue. Both are used in the histological and histopathological studies. 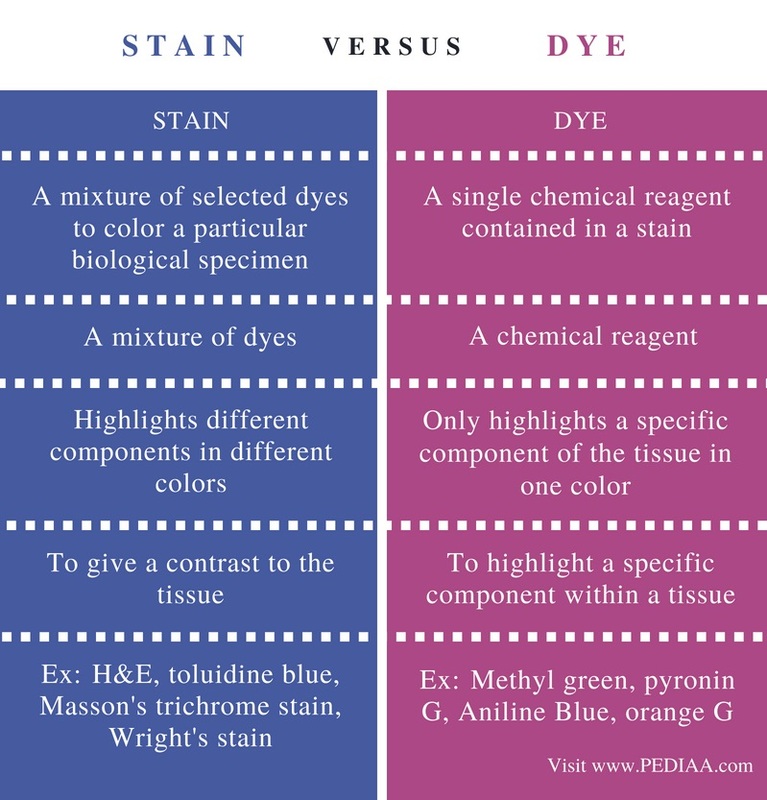 A stain is a mixture of dyes that give a contrast to the different components of a tissue on a microscopic slide while a dye is a chemical reagent that highlights a specific entity in the sample. 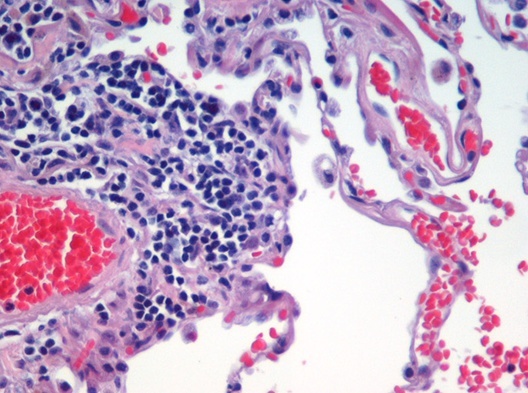 The main difference between stain and dye is the role of each solution in histology staining.